Maxim Mogilevsky comes from an exceptionally distinguished family of musicians: his great-grand father Alexandre Mogilewsky, friend of Rachmaninoff, Koussevitzky and Scriabin, was a notable violinist who lived and taught in Harbin and Shanghai, was a professor at Geidai University in Tokyo (艺大), and was one of the founders of the Japanese Violin School. His grandfather cellist David Mogilevsky was a founding member of the Glazunov String Quartet and a friend of Shostakovich. His father pianist Yevgeny Mogilevsky won the 1964 Queen Elisabeth Competition in Brussels. Having impressed audiences worldwide with his fiery performances and distinctive interpretations, Maxim Mogilevsky made his debut at age thirteen with the Moscow Philharmonic Orchestra and Dmitri Kitayenko to widespread acclaim. Since then he has gone on to perform as a soloist with major orchestras around the world, and undertaken many unique artistic projects. 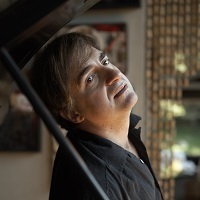 Called by The Washington Post “…a pianist with distinctive personality, outstanding technique, and an inclination to stamp his own imprint on whatever he plays,” Mogilevsky has become a favorite of musicians and audiences worldwide. His orchestral appearances include the New York Philharmonic, Seattle Symphony, Turku Philharmonic, Orchestre National de France, Rotterdam Philharmonic, Mariinsky Orchestra, St Petersburg State Symphony Orchestra, Russian National Orchestra, Orchestra Novaya Rossiya, Moscow Soloists Ensemble, Svetlanov Orchestra (“GASO”) and the St. Petersburg Philharmonic Orchestra, to name a few. Maxim has performed under the batons of internationally renowned conductors, including Seiji Ozawa, Gerard Schwarz, Yuri Bashmet, Mikhail Pletnev, Leif Segerstam and Valery Gergiev among many others. Along with recital performances on five continents, Mogilevsky’s notable appearances include those at Carnegie Hall, Lincoln Center, the Kravis Center, and Segerstrom Center for the Arts, Lincoln Theater, Jordan Hall, as well as at the Salzburg, Edinburgh, Ravinia, Ruhr Klavier and Spoleto Festivals. Mogilevsky’s New York debut in December 2007 was with Mariinsky Orchestra and Maestro Valery Gergiev at Carnegie Hall and in May 2010 with the New York Philharmonic and Gergiev. He undertook a two-month-long tour of South America with the St. Petersburg State Symphony, and presented a collaborative project with four ballerinas from the Mariinsky Ballet performing Tchaikovsky’s “The Seasons” at the Russian National Orchestra Festival. Maxim has also performed at the Red Sea Gergiev Festival in Israel, the Great Hall of the Tchaikovsky Conservatory in Moscow, and in recital in Los Angeles, Miami, Tokyo and Paris. Maxim opened Martha Argerich’s “Progetto” Festival in Lugano with a recital in 2013. He won the “Golden Mask Award,” together with ballerina Diana Vishneva, for their performance of Schoenberg’s “Pierrot Lunaire”, choreographed by Alexei Ratmansky. Most recently, Maxim performed with Yuri Bashmet and the Moscow Soloists at the Bashmet International Academy and Festival in Samara, Russia. He will be the featured soloist with the State Academic Orchestra of Russia (GASO) during their 2018 tour of Asia, with performances in Korea, China, and Hong Kong. Maxim Mogilevsky recently released a recording of the Tchaikovsky Piano Concerto No. 3 with Vladimir Lande and the St. Petersburg State Symphony Orchestra for Marquis Records. He was also featured on recordings of Stravinsky’s “Les Noces” with both the Rotterdam Philharmonic and the Mariinsky Orchestra under Valery Gergiev, the latter of which received the prestigious 2011 International Classical Music Award. Cooperation with the Louis Vuitton Moet Hennessy company also is an important connection. Maxim has appeared at many concerts and events organized by LVMH, in settings as diverse as Vietnam (Hanoi Opera House), St Petersburg (Yusupov Palace), Moet Chandon Palace at their headquarters of Epernay (France), in Florence (Villa Strozzi), Palermo (Teatro Massimo), Sicily (Villa Tasca), the Bologna Festival, Maggio Fiorentino of Florence (Teatro Goldoni), Teatro Lirico of Milan, Venezia Biennale and at the Salzburg Festival. In the summer of 2015 Mogilevsky organized a piano institute together with the Lang Lang Music World at The Summit Music Festival in New York. Later in August 2015 directed a workshop in cooperation with the Beijing Central Conservatory and German Goethe Institute in Boston, MA. Mogilevsky has served as adjudicator at the Kazakhstan International Piano Competition, Lang Lang Competition, Moscow Conservatory International Piano Competition, Sorantin Music Competition in Texas and the Tchaikovsky International Junior Competition. Mogilevsky is piano program director at the Yuri Bashmet International Festival and Piano Academy in Samara (Russia) and also program director to yearly piano workshops in Kazan, Rostov, Novosibirsk, Yekaterinburg and Khabarovsk. Last year Mogilevsky organized a Shostakovich Festival and a Teaching Academy at the China Conservatory in Beijing and directed a summer academy at the Summit Music Festival in New York. He conducts summer and spring courses at the Schlern Music Festival in Italy, International Musiktage in Germany and the Music Academy at Les Orres in Marseilles, France. A recent guest artist at Boston University, Mogilevsky worked as an Assistant Professor at Oberlin Conservatory from 1996-2001, and as Visiting Assistant Professor at the Eastman School of Music during the 2009-10 academic years. He also taught at Boston University as guest artist in 2011-2013. He started teaching at the New England Conservatory in January 2015. At the request of Mr. and Mrs. Sherman of NEC, Maxim prepared their student George Li for the XV International Tchaikovsky Competition in Moscow in the summer of 2015, where George Li won second prize. Last year he began teaching as guest professor at Tokoha University Music College of Shizuoka, Japan. He was also appointed guest artist at the Hong Kong Academy for the Performing Arts and at Kunitachi College of Music in Tokyo. This year Mr. Mogilevsky has been invited to teach at the Accademia Pianistica Incontri Col Maestro in Imola, Italy, and to give masterclass at the Leopold Mozart Summer Piano Academy in Augsburg, Germany. In addition to his performing career, Mogilevsky holds the post of Distinguished Professor and Director of the Piano Program at Suzhou University of Science and Technology in Suzhou, Shanghai region, China. He is also an artistic advisor to the Jiangsu Center for the Performing Arts, China. When not travelling, he resides in China, Russia, Europe and the United States. Revised 10 October 2017 - Please destroy all previous or undated biographies.